Florida's new governor Ron DeSantis has suspended Broward County Sheriff Scott Israel over his department's much-maligned response to the Marjory Stoneman Douglas High School shooting last February - which took the lives of 17 students and staff - and installed the county's first African-American sheriff, former Coral Springs police sergeant Gregory Tony, according to official statements. On Friday evening, three days after being sworn in, DeSantis issued a tweet saying that "effective immediately, I am officially suspending Broward County Sheriff Scott Israel for his repeated failures, incompetence and neglect of duty." The tweet linked to an executive order signed by the newly-minted governor. Israel reacted shortly after the governor's announcement, holding a press conference in which he defended his tenure and contended that he was a victim of local politics. "There was no wrongdoing on my part," Israel said at the press conference. "I served the county honorably." Israel said he plans to "vigorously fight this unjustified suspension" and intends to return to office soon. "This was about politics, not about Parkland," Israel said. Among a raft of criticism, DeSantis' executive order noted that Broward County Sheriff's Department personnel had 21 interactions with the school shooter prior to the massacre, the first one coming in February 2016 - two years before the attack - when the shooter "posted a picture of a gun with a statement similar to, 'I am going to get this gun when I turn 18 and shoot up school.'" Israel has been the subject of extraordinary criticism in the wake of the massacre on Valentine's Day 2018. 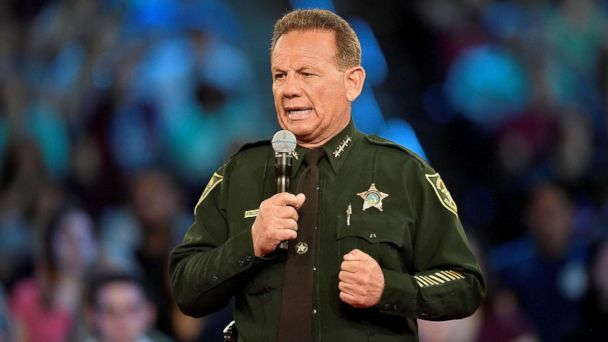 Last spring, about two months after the shooting spree, 534 out of 628 deputies issued a 'no confidence' vote in his leadership compared to 94 who voted in confidence of the sheriff, Jeff Bell, president of the Broward Sheriff's Office Deputies Association, told ABC News at the time. "I will not be distracted from my duties by this inconsequential ... union vote, which was designed to extort a 6.5 percent pay raise from this agency," Israel responded, in part, to the union vote. Last month, the Marjory Stoneman Douglas High School Public Safety Commission issued a scathing report about the Broward County Sheriff's Department, specifying that one of Israel's key active shooter policies may have contributed to the carnage. The commission noted that a written policy saying that Broward County deputies "may" confront active shooters, rather than "shall," provided an excuse for not entering the school to confront the shooter. In response, Israel told the commission that he didn't want deputies entering into "suicide missions," according to the Associated Press. Responding to the commission report last month, Israel said that all Broward sheriff's deputies completed an additional eight hours of active-shooter training, that the department has created a threat assessment unit and that it has enacted other reforms. When asked by CNN days after the shooting whether he would have done anything differently, Israel famously replied, "If 'ifs' and 'buts' were candy and nuts, O.J. Simpson would still be in the record books." Tony, 40, of Boca Raton, spent 12 years at the Coral Springs Police Department, where he served in a variety of roles, including five years on department's SWAT team, as well as positions in narcotics investigation, street intelligence and burglary investigation, according to the Sun Sentinel newspaper. Tony left the department in 2016 to focus full time on a business he started, called Blue Spear Solutions, which provides threat assessments to schools and other businesses, and provides training to prepare for active-shooter and mass casualty incidents, according to the newspaper.